It has been 17 years and 109 days since the city’s pledge to build the West Branch Library. In the Arizona Republic of April 17, 2015 Peter Corbett has reported in a story entitled State vows to block casino in W. Valley, the state is prepared to block the Tohono O’odham casino from opening in Glendale this fall. Here is the link: http://www.azcentral.com/story/news/local/glendale/2015/04/16/arizona-gaming-agency-will-block-valley-casino-opening/25915541/ . Arizona’s Department of Gaming director, Daniel Bergin, recently sent a letter to the Tohono O’odham (TO) in which he claimed “fraud perpetrated by (the tribe) upon the state, Arizona gaming tribes and the state’s voters.” On that basis he could not allow the casino to open. He went on to say, “…the (gaming agency) would exceed its authority if it were to proceed with certification…” The agency’s position is supported by Governor Doug Ducey. Ducey in a letter to the agency directed it to deny a gaming license and said that the TO was forcing the issue by construction of the temporary casino now. Don’t forget that more action waits in the wings. The Keep the Promise Act of 2015 introduced by Senators McCain and Flake will see a vote up or down this year. The general assumption is the legislation will pass through Congress and stop the casino for once and for all. It’s time to shut the doors on a Tohono O’odham casino, temporary or otherwise, in Glendale. It is ironic that a tribe that promotes gambling, itself gambled. It looks like the house will win and they will lose. Referability…what the heck is it? 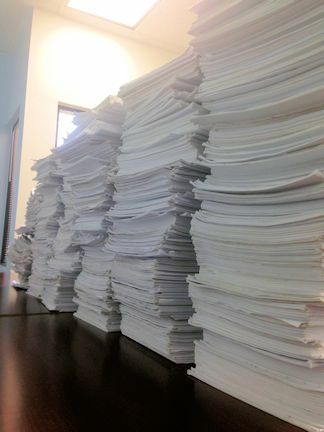 On September 12, 2014 two political action committees, No More Bad Deals for Glendale and Respect the Promise turned in approximately 15,000 petition signatures collected in 28 days for each of two referendum petitions. These petitions seek to overturn the city council votes of August 12, 2014 approving a settlement agreement with the Tohono O’odham and supporting the TO’s reservation status by requesting an election. The approximately 15,000 petition signatures turned in is greater than the 10,914 Glendale citizens who exercised their right to vote in the recent Primary Election. That’s disconcerting. You would think that the number of petition signatures collected would send a strong message to this city council that Glendale residents want to weigh in on this issue by virtue of an election. The Glendale City Clerk has 20 business days to do something, anything with the petitions before she turns them over to the Secretary of State. She is not an independent agent. She will be told what to do. Now it gets interesting. Wanna-be mayor, Councilmember Gary Sherwood was in attendance for the delivery of the petitions to the City Clerk. He could be heard muttering, the council votes of August 12th are not referable and these petitions are no more than toilet paper. You can be sure the “gang of four” (Sherwood, Alvarez, Hugh and Chavira) as the majority on council will give direction to the City Manager and City Attorney to reject these petitions. The City Attorney and his minions are burning the midnight oil to find Arizona case law that supports the city’s act of rejection. What does “not referable” mean? The city will take the position that the council votes were not legislation per se. Therefore the petitions which seek to refer those council actions to Glendale residents are not valid and thereby rejected by the city. Their position will be that those council votes were not legislative action and only legislation can be referred to the voters. Make no mistake. Both groups, No More Bad Deals for Glendale and Respect the Promise are prepared to go to the legal mat on this issue of referability. If and when the city rejects the petitions on those grounds expect both groups to file suit. Isn’t it ironic that Alvarez and her merry band of pro casino councilmembers have complained bitterly about the money spent by the city on legal action when its position was in opposition to the casino and reservation? Will they decide not to spend money to defend the city’s position of petition rejection now that the city supports the casino and reservation? I guess the spending of taxpayer money on legal action depends on whose ox is being gored. Alvarez, nearly every time she casts a “no” vote on a major city issue, can be heard pontificating that it is an issue upon which Glendale residents should vote. This time she has been amazingly silent in advocating that view when it comes to the casino and reservation. What, Norma, when it’s an issue you personally do not like it merits a vote of the people but when it is an issue that you do like, forget the people? For those of you following this saga, this Wednesday, September 17, 2014 at 2:30 PM, Eastern time (11:30 AM in Arizona) the U.S. Senate Committee on Indian Affairs will hold a legislative hearing on Senate Bill 2670, Keep the Promise Act of 2014, introduced by Senators John McCain and Jeff Flake. Here is the link to the site where it can be viewed live, online: http://www.indian.senate.gov/hearing/legislative-hearing-s-2670-keep-promise-act-2014 . If this link doesn’t work please copy and paste the link into your browser. It appears that the bill could be marked up and passed out of committee for a full Senate vote. If that is the case and the bill is approved in the Senate there would be a House and Senate Conference Committee meeting to make sure the House version and Senate version of the bill are in agreement. It would then go to the President to sign or veto. If the bill were to be successful the Tohono O’odham, despite their ground breaking, would not be able to build a casino in Glendale or any other portion of the Phoenix Metro area. On another note, to date the Attorney General’s Office is still investigating the alleged Open Meeting Law violation by Councilmembers Sherwood, Knaack, Martinez and Chavira. If the complaint had no merit we would have received that opinion by now. The fact that it is taking so long would lead one to assume that there is merit to the allegations. If that turns out to be the case, look for some kind of major sanction against Councilmember Sherwood and perhaps a minor sanction for the three others. I wouldn’t be surprised if the AG’s Office required another vote on the original IceArizona/City of Glendale Management Agreement. This, too, could prove interesting dependent upon which candidates win council seats at the General Election in November. It looks like Councilmember Hugh has met with Lauren Tomachoff and Bart Turner. Tolmachoff is a candidate for the Cholla district seat and Turner is a candidate for the Barrel district seat. It seems Councilmember Hugh is busy trying to build his own coalition. It appears that he fancies a run against current Mayor Jerry Weiers. Hey, Jerry, watch out! It looks like they are starting to line up for a run against you…Sherwood and now, Ian Hugh. It wouldn’t be too surprising to see Councilmember Knaack (retiring in January, 2015) decide on a run for mayor. Being part of a clearly dysfunctional council is no fun but perhaps becoming mayor is. A lot is riding on this Attorney General Office’s investigation. It could kill any mayoral ambitions of both Sherwood and Knaack. It’s rather difficult to win the support of the Glendale electorate if you have been found to have violated the law. Just when you thought Glendale’s problems were cooling down, they’ve heated up again. As President Truman once said, “If you can’t stand the heat, get out of the kitchen.” I wonder if the Glendale city council loves the kitchen heat now.